This world was made from a 360 degree panorama. Read this to find out how to make your own planet. 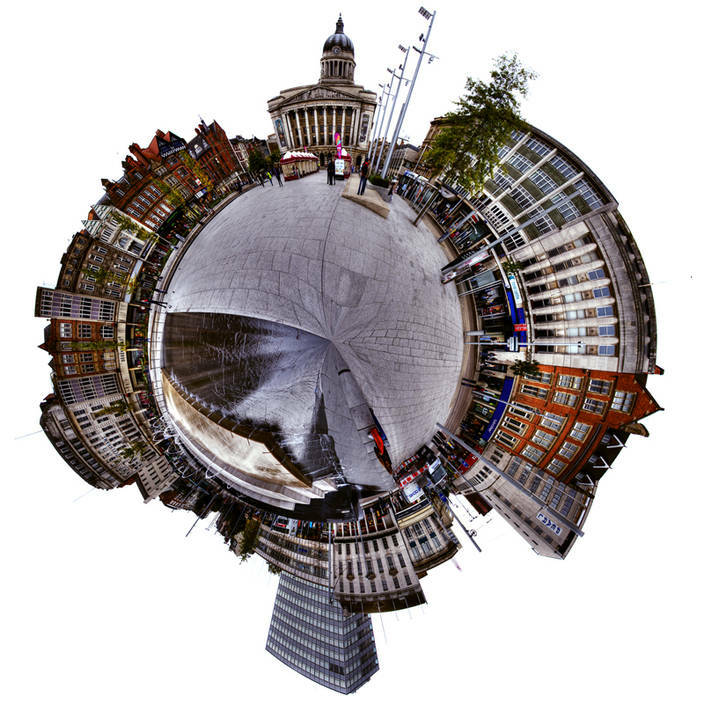 The biggest problem with making planets out of city panoramas is you need to be far enough away from the buildings to get them all in, and at the same time you need do get enough of the ground in to avoid getting heavy distortion in the centre of the image when you convert it into a planet. Fortunately this spot in Nottingham market square was just right. The clouds at the edge of this image had some distortion so I used the dodge tool set to highlights to isolate the image on pure white. You seem to be a master with the little planet effect. Well done Jason. As far as your question is concerned well, there’s in fact a mix of effects; such as HDR, Orton effect, selective desaturation. This one was taken with a 200 mm lens in an old cars event in Paris. As you see I like to mix and I try, and try and try again. Sometimes it doesn’t work, sometimes it does. Thanks for dropping by. Thank you Florence. I love your talent for taking images way beyond the original capture. Now I just need to choose an image to try this technique.